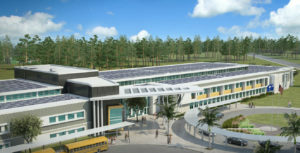 Energy Positive Schools vs. Net Zero Schools: What’s the Difference? When classifying a building, many people use the terms “energy positive” and “net zero” interchangeably. What most do not realize is that there is actually a big difference between the two terms. While both types of buildings are highly efficient and cost-effective, their titles are based on the level of energy efficiency. At Firstfloor Energy Positive, we define a net zero building as a building that generates as much electricity as it consumes. An energy positive building, on the other hand, is a building that generates more electricity than it consumes. Often, the goal of an energy positive building is to eliminate electrical costs overall. According to the U.S. Department of Energy, schools actually spend more on electricity and natural gas than they do on textbooks and computers. That being said, net zero and energy positive schools are actually a long-term investment in the quality of education students are getting. Over the past 10 years, Firstfloor Energy Positive and SfL+a Architects have been teaming up to create turnkey development solutions for educational institutions. A big focus has been creating engaging environments that positively impact people, communities and the environment through alternative delivery methods. Through that, we aim to deliver extremely energy efficient buildings, including energy positive schools. Sandy Grove Middle School produces 60% more energy than it consumes and is ENERGY Star 100 Certified! These energy positive schools produce more energy than they consume! Each building features thermal energy storage, centralized geothermal HVAC, solar PV, LED lighting, enhanced building automation, indoor air quality monitoring and superior building envelope. Get an inside look at these brand new schools here! This new school showcases a modern take on the traditional library with media spaces that open from the classrooms for true 21st century, student-centered learning environment. Teachers can even use the school itself, with respect to the consumption of water and electricity and the production of electricity, as a teaching tool with the internal dashboard that shows how the school is performing! Learn more about Firstfloor Energy Positive and what we’ve accomplished here.